Additionally, recognize that the reason why you might adopt any concealed carry guidelines is to keep your employees safe and comfortable. 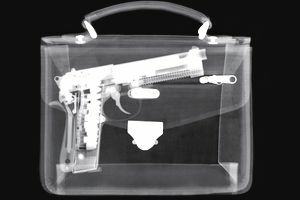 People have a wide range of familiarity and experience with weapons and knowing that a gun is carried on the hip of their colleague in the next cubicle may exceed their comfort level. Employers also want to avoid the unnecessary risk of intentional or accidental shootings. Consequently, the majority of employers have adopted a ban on concealed weapons at work even when their carry is legal as in the case of an employee who has a permit to carry hidden, loaded handguns (CCW permits ). This does infringe on the rights of the concealed weapon permit holder but honors the comfort level of the greater community. Weapons are also not allowed in many public places and in venues with the capacity to hold over a certain number of people such as conference centers and concert halls. As with any policy that infringes the rights of some employees or is likely to draw legal concerns and criticisms, you are advised to run any concealed weapons policy that you adopt by your employment law attorney. She can check the verbiage and determine whether the policy is legal and permitted in your jurisdiction. Employees may not, at any time while on any property owned, leased or controlled by Your Company, including anywhere that company business is conducted, such as customer locations, client locations, trade shows, restaurants, company event venues, and so forth, possess or use any weapon. Weapons include, but are not limited to, guns, knives or swords with blades over four inches in length, explosives, and any chemical whose purpose is to cause harm to another person. Regardless of whether an employee possesses a concealed weapons permit (CCW) or is allowed by law to possess a weapon, weapons are prohibited on any company property. They are also banned in any location in which the employee represents the company for business purposes, including those listed above. Possession of a weapon can be authorized by the company's president to allow security personnel or a trained employee to have a weapon on company property when this possession is determined necessary to secure the safety and security of company employees. Only the president, or his designee, may authorize the carrying of or use of a weapon. Employees who violate this policy will be subject to disciplinary actions, up to and including employment termination. The employment termination would be characterized as termination for cause. As with every sample policy on this Human Resources site, the sample policy is the starting point for your own policy development. This site serves readers in every state and in countries all over the world and cannot possibly anticipate and reflect all of the local, state, or regional differences in laws. Readers have let me know that in Kentucky and Florida, as two examples, it is legal to keep a legally owned weapon in a locked automobile on company property. Susan Heathfield makes every effort to offer accurate, common-sense, ethical Human Resources management, employer, and workplace advice on this website, but she is not an attorney. The content on the site is not to be construed as legal advice. The site has a world-wide audience and employment laws and regulations vary from state to state and country to country, so the articles cannot be definitive on all of them for your workplace. When in doubt, always seek legal counsel. The information on the site is provided for guidance only.